The Red-billed Quelea was first described in 1758 by Linnaeus. He erroneously gave the origin of the species as India. In 1760 Brisson painted this species based on a specimen, probably from Senegal, and in 1766 Linnaeus corrected the type locality to Africa (later restricted to Senegal by Sclater). 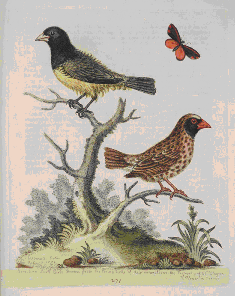 In 1760 the species was also illustrated by an English artist, Edwards, and called the Brasilian Sparrow. Edwards painted it from a living bird that he believed to come from Brazil or Angola. Identification: identified by its red bill (may be orangy or yellow in the female), reddish eye-ring, and yellowish edges to the primaries. There is a seasonal change in plumage - males resemble females in winter. Sexing: The male has a black or white mask, surrounded by varying amounts of pink. The female has a brownish/greyish head with a plain crown and a buff eyebrow. Breeding females may have a yellowish bill. Ageing: The young bird is similar to the adult female, but duller. This is a female Pin-tailed Whydah, which also has a reddish bill. Note however the dark streak above the eyebrow. Red-billed Queleas may feed in mixed flocks of seed-eaters, so care needs to ba taken to not confuse them with other, similar-looking birds. The features mentioned above, however, mean that a positive identification can be made if good views are obtained. This species is common throughout much of Africa. 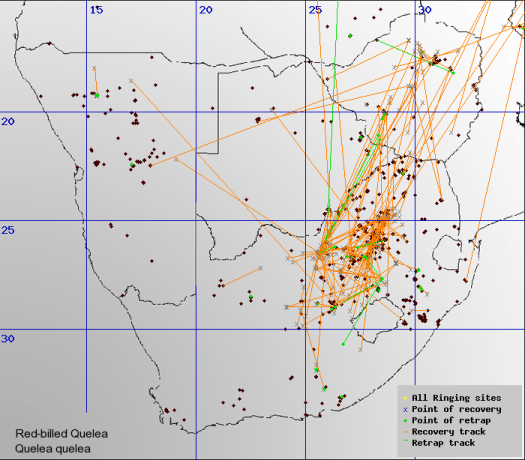 Large breeding colonies occur in the Kruger national Park and other areas. Colonies are usually sited in different places year to year so it is difficult to predict precisely where to find a colony. 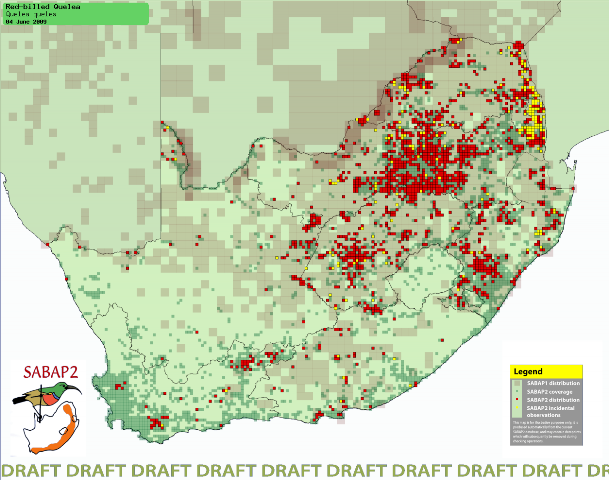 The closest breeding colony to Cape Town was found at Worcester. Read more here.